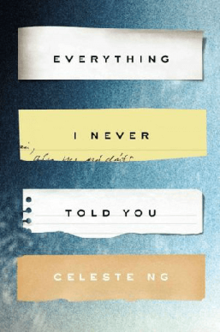 While I am waiting for “Little Fires Everywhere” (currently is Hello Sunshine’s Book Club Pick for September 2017) to be returned to my local library, I grabbed another one of Celeste Ng’s books to check out her writing style and see if the hype was all that it is cracked up to be. This story was a glaring example of racism spanning from the 50’s to the 70’s. But it’s not what you would expect. I think when most people think of racism in that time frame their mind goes straight to the Civil Rights Movement, and the change in way people viewed African Americans. But, there was a group of people that I think were overlooked. I firmly believe this because it was something I hadn’t heard about in history class or in the news. “Everything I Never Told You” is a story about a mixed family, part Chinese/ part white. We get to see how James struggled as a Chinese American being raised by parents who had immigrated from China. (I didn’t know that there had been a ban on allowing Chinese immigrants into the country, as they were entering the country on the completely other side of it.) James struggled to fit in, even going to the point of teaching American History in college, with his focus on the American Cowboy. He meets a beautiful blonde who was hell-bent on being the complete opposite of her mother. She wanted to stand out in the world of men. She wanted to be a doctor, not a homemaker. She had goals and dreams beyond what her mother had wanted. Then she met James. Even when they got married, her mother strongly warned against it. Only because he was Chinese. As the story unfolds, we see Lydia, struggling to live out her mother’s dream, even though it wasn’t her own. We find Nath trying to be content sitting in his younger sister’s shadow while hoping his parents would notice his accomplishments. Then there is the younger sister Hannah, who’s quiet nature helps her to absorb all the feelings, movements, and changes in the house dynamics without anyone noticing. Celeste Ng spins a tale of heartbreak, that being loved too much can be just as deadly as not being loved enough, and that our relationships can come to a angry head when we don’t express our feelings to each other. Our assumptions about how the other person feels, or their wants, can be tear a family apart. While I wish there a more concrete explanation at the end, the flashing between the past and present really helped the reader understand each character and their actions. I felt sorry for each one of them, despite their choices, for each were just trying to make a way in an unsympathetic world.